Spots on front teeth are ususally caused by either plaque or too much fluoride. We will need to determine what the cause it first. If they are getting worse with time, it is not fluoride, it’s decalcification [areas where cavities are just starting, but not enough to make holes–yet.] Flourosis is usually confined to the front teeth, and does not worsen with time. Spots are treated with micoabrasion [an acidic pumce slurry in a dental handpiece] to buff out the surface–life buffing out the surface scratch on paint. 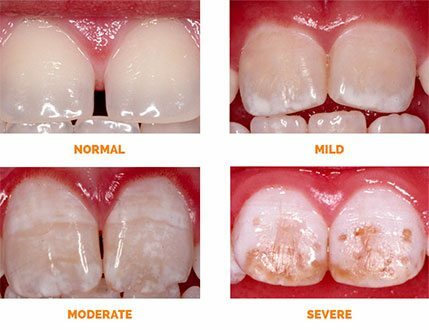 If the spots are deeper, or collect stains or discolorations, we may need to put fillings in the pitted/deeper areas [see image above].